Stop Online Puppy Mills NFP is a 501(c)3 tax exempt organization dedicated to eliminating puppy mills by educating consumers and exposing the cruel, inhumane and deceptive puppy mill industry. 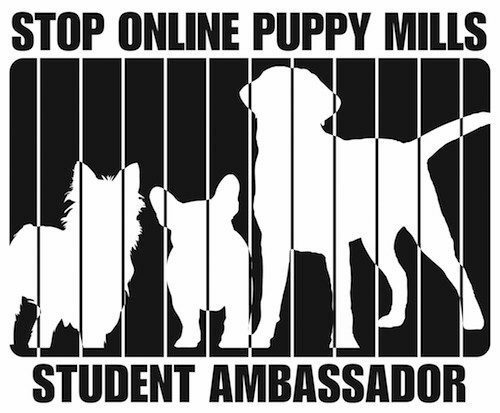 Stop Online Puppy Mills believes that exposure and education will stop the demand, end the breeding of dogs in puppy mills and redirect consumers and families to adopt from breed rescues, shelters or purchase from responsible breeders. The internet is a 24-7 unmonitored marketplace and online puppy sales are skyrocketing. There are an estimated 10,000 puppy mills in the US producing around 2,000,000 puppies a year. Approximately 1,000,000 of those puppies are sold online. The dogs living in these licensed and unlicensed breeding facilities most likely are deprived of proper medical, physical and emotional care. The dogs are caged for life in conditions that most people would considered inhumane. It is hard for uneducated consumers to associate the puppy being sold online through breeders, broker websites, or in pet stores with puppy mills. The general public is overwhelmingly against puppy mills. We believe once consumers learn about puppy mills, they will make an effort to buy from responsible breeders or adopt from a rescue or shelter. Educating consumers and spreading awareness is critical to putting an end to this industry. Our campaigns provide information so consumers can do their homework and be informed about puppy mills. People buying dogs do not have the knowledge to recognize the deception or to make good choices. Our campaigns are designed to educate consumers and expose puppy mills while consumers are searching for puppies online, at the point of sale and more. 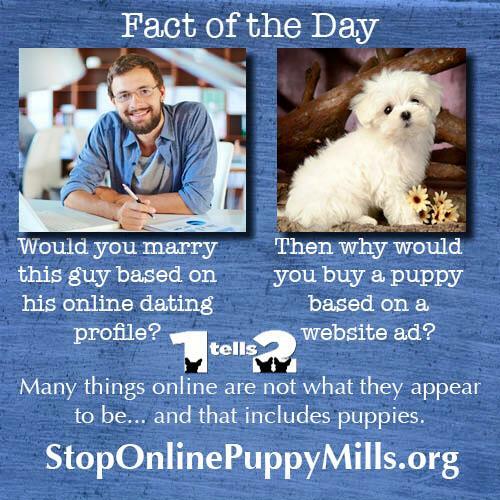 Stop Online Puppy Mills wants to provide that information and create a more informed, educated consumer. Our years of experience in first hand rescue, mill research and marketing give us a strong foundation to fulfill this objective. Our campaigns target the general population as well as focus on young adults and consumers that are searching for puppies online or at the point of sale. Our extensive social media and educational campaigns, reach thousands of consumers daily. It is through this awareness that consumers will be educated about the puppy mill industry. Millennials are used to buying everything online, so educating them about not buying dogs online is important. The wide reaching power of social media platforms and effective messaging and marketing materials will help reach a wide audience to ensure our message is seen. The 1 Tells 2 campaign is designed to encourages people to share with two friends a fact about puppy mills. If everyone did this in around 31 days the entire population would know about puppy mills. The Did You Know? campaign is all about puppy mill facts and figures. This campaign is designed to help educate about the realities puppy mill breeding dogs endure 24/7/365. This campaign exposes the truths of puppy mill cruelty. Attention students! Want to help end puppy mills? If you are an animal lover that is active on social media, join our growing team of ambassadors who attend colleges and universities across the county. Help make a difference for puppy mill dogs. Please read these posts. Educate yourself, then share the post & what you have learned with others. I do! Stop Online Puppy Mills, thank you for bringing light to this cruel industry! Your posts are excellent and I share them to my status everyday. I have 3 dogs all rescued from puppy mills. There was a time when I did not understand what a puppy mill was. 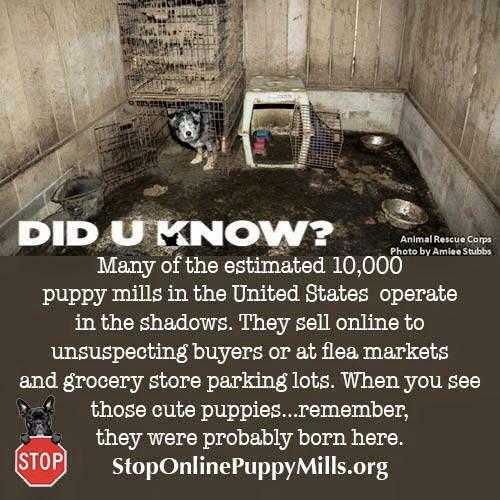 Stop Online Puppy Mills does a great job of explaining and exposing mills. Keep up the great work. Thank you! As a Vet Tech, I have seen first hand the realities, pure neglect and cruelty of puppy mills. 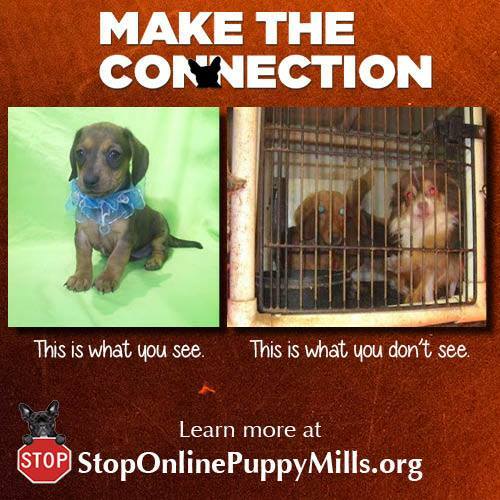 Stop Online Puppy Mills is doing a great job of educating and spreading the word. The general public does not support this cruelty. So happy you are spreading the word for the dogs (cats and rabbits) in mills.